I love a good bargain. The skirt is cute. Maddie , I am crazy about thr blouse and bracelet ! great finds! Great selection, I love the bracelet! Ah, I adore the skirt! Those are some very pretty pieces. What beautiful items. The shoes looks great. Fabulous. All this worn together would pretty much be my dream outfit. I've been looking for a skirt like that too. the colors!! 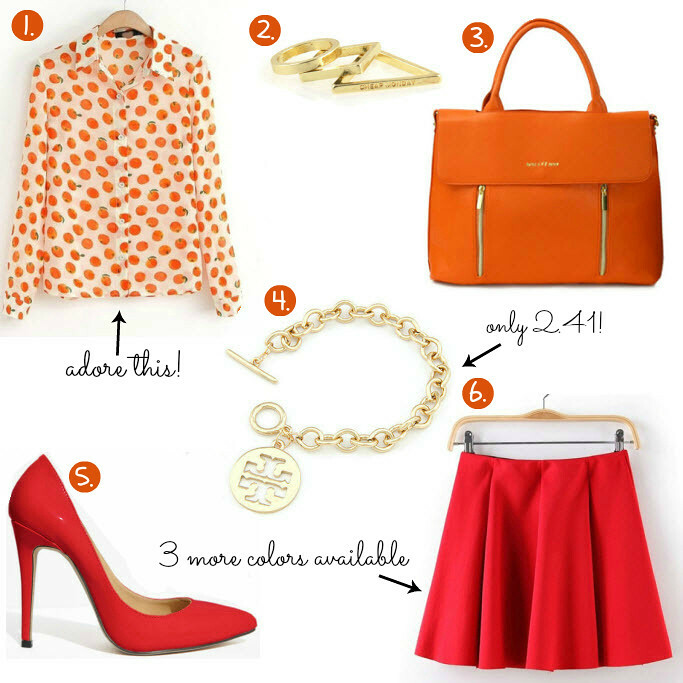 all of these really caught my eye – I'm usually not a fan of orange but the purse is super cute! I've nominated you for the "Very Inspiring Blogger Award" and I hope you like it! Please, check out my new post to see it! Ooo I love these pieces! Such a great collection. This orange blouse is lovely and I adore the purse you chose. So fun and summery! The orange print blouse is so cute & I imagine this bright orange colour would suit you perfectly too! Love those geometric shape rings too!